The folks at Chilbolton are seriously into cables at the moment! Here's the latest on the cables. 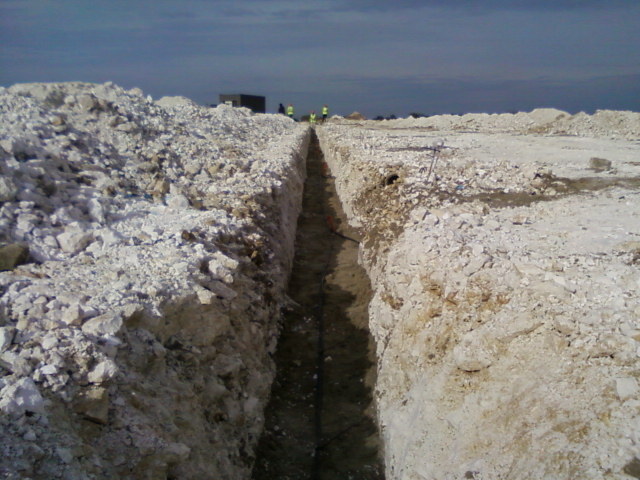 The cables for both the HBA and LBA fields are done in "river" mode. Each antenna has two cables. These go down into the trench and head off in the direction of the RF-container, where the processing will occur. 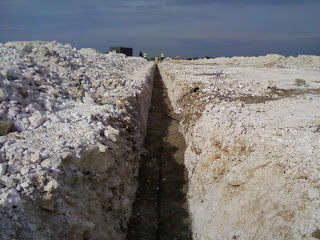 As they pass through the trench, new cables come in from other antennas. Each new "stream" adds to the "river" and the bundle of cables slowly builds up. This scheme requires care. The cables must be put into the trenches in the correct order and the covering soil cannot be added until the full river has been built up. Managing the bundle of cables as it nears its destination also becomes difficult. The become difficult to handle and must the meticulously checked to ensure that no small stones are caught between the strands. 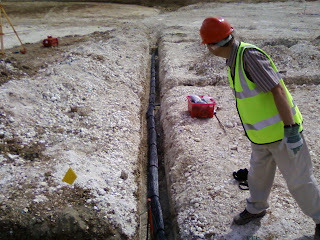 Here is the start of stream, with a pair of cables (one per polarisation) heading off down the trench. Half way across the array and already the cable group has become quite substantial. In this section, there are 128 cables in the bundle. Jon Eastment is checking that everything looks OK.